Recently, we witnessed the power of Microsoft's political machine when one of the champions of free and open source software, Peter Quinn resigned as CIO of the Commonwealth of Massachusetts. In my opinion, Microsoft just blinked and everything went south. Other writers have also commented on the chain of events in Massachusetts. For example, Andy Undegrove writes a farewell piece in his blog to the maligned public servant. Steven J. Vaughan-Nichols also writes an article about this issue in Microsoft Wins, Open Standards Lose. Steven writes: "CIO Peter Quinn's story tells us that if you go up against Microsoft, you can expect everything and the kitchen sink to be thrown at you." Well Steven, as much respect and admiration as I have for you, Microsoft didn't even breathe hard. They looked in the direction of bean town and people started doing their bidding. That's what happens when you own a country. One of the top stories of the year at LXer warned mightily of Microsoft's capabilities. So, I brought it back out and rewrote it. It you don't get it this time, you never will. Anyone doubting the power of Microsoft, should consider what we said at the end of June 2005. We've also added the preceding article to this text - and made some changes. But the documents we uncovered are still in place. The people within Microsoft's grasp politically are still listed. This isn't a story you scan. This is one you read. The liberty of a democracy is not safe if the people tolerate the growth of private power to a point where it becomes stronger than their democratic State itself. That in its essence, is Fascism - ownership of government by an individual, by a group or by any controlling private power. In the same letter he writes, "One of Microsoft's high-level executives says (published) that freely distributed software code such as Linux could stifle innovation and that legislators need to understand the threat." Little doubt exists that Microsoft has reached legislators. In an earlier article added to this one below, we discussed how a dispute in the House Ethics Committee has kept the members from meeting and considering House Majority Leader Tom DeLay's activities that could have ramifications for Microsoft. In making legislators aware of many issues, the Redmond company's financial reach may be part of why the committee has delayed their investigation. Perhaps everyone involved hopes that a delay will allow the heat to pass on this and other issues. A dispute that has kept the House Ethics Committee from considering Majority Leader Tom DeLay's activities may have ramifications for Microsoft. When one begins to untangle the remarkable political organization created by Microsoft and lobbyists Preston, Gates Ellis et al, you find some uncanny coincidences. The ethics committee, the House's mechanism for enforcing rules for members, has operated for exactly one day since Congress convened in January. In the meanwhile, a former Preston, Gates and Ellis lobbyist, Jack Abramoff has become the target of several serious investigations and the focus of the D.C. media. Abramoff left Preston Gates in 2000. Even so, he's a problem for the firm's management. Reports have surfaced questioning Abramoff's financing of travel for lawmakers, especially House Majority Leader Tom DeLay (R-Texas). All of the spending under investigation happened while Abramoff worked at Preston Gates. The Washington Post reported that airfare to London and Scotland in 2000 for House Majority Whip Tom DeLay (R-Tex.) was charged to an American Express card issued to Jack Abramoff. House ethics rules bar lawmakers from accepting travel and related expenses from registered lobbyists. Many people believe that Microsoft helped construct Preston, Gates & Ellis as an alter ego for the Business Software Alliance. The firm of William H. Gates Sr., father of Microsoft co-founder Bill Gates, merged with Preston in 1990. The later old line Seattle firm started when Harold Preston located in Seattle from Iowa in 1883 and began practicing law. Jim Ellis joined Preston in 1949. By getting William Gates Sr. together with Preston, Microsoft suddenly had an organization that looked like a law firm and not the legal department of Microsoft. The Seattle firm also had a small office in Washington, D.C. which helped Microsoft and the Business Software Alliance reach out and affect government policy. 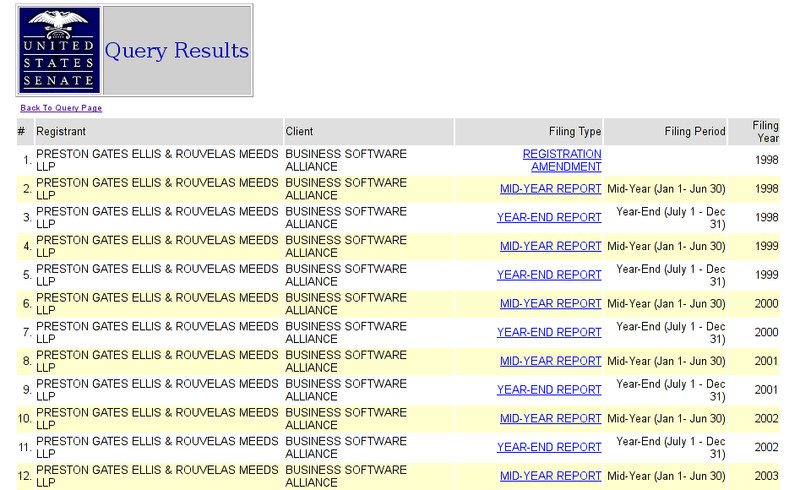 But, Preston, Gates & Ellis needed to show some lobbying fees and clients other than Microsoft and the BSA. Adding Abramoff did just that. Additionally, he had his own clients and did not have to work on any Microsoft or BSA business. Adding Abramoff accomplished the goal of diversifying Preston, Gates & Ellis revenue and client base. But, Jack Abramoff didn't fit the culture. While most lobbyists seem happy with a six figure salary, Jack made millions annually. He also could be considered a maverick. Now, the partners of Preston Gates must deal with the consequences of discovering their firm is listed on the invoice for Tom DeLay's plane fare to Scotland. They may also have to consider how deep and far the probe of their firm may go. For example, both Preston Gates and the Business Software Alliance are listed as contributors to the campaign of Senator Patrick J. Leahy, the Chairman of the Senate Judicial committee that ruled on the Government's settlement with Microsoft. Meanwhile House majority leader Tom DeLay says that expenses on his trip were paid by a nonprofit organization and that the financial arrangements for it were proper. He contends that he had no way of knowing that any lobbyist financially supported the trip, either directly or through reimbursements to the nonprofit organization. Non-profit organizations, foundations, multiple corporate entities seem like the products of a firm like Preston, Gates & Ellis. Someone will want to look into those issues. For example, on June 7, 2005, Bill Gates profile on CampaignMoney.com shows that he's contributed $59,100 since 1999 to all political candidates. Of course, that's personal money. Given the tens of millions of dollars attributed to Microsoft in campaign contributions, it might look like some kind of front organizations have made contributions beneficially for the welfare of the richest man in the world. And the connection between Tom DeLay and Jack Abramoff: DeLay helped defeat a bill that would tax Preston Gates clients - American Indian casinos. You have to also wonder if those casinos used Microsoft Office. What we did not discuss in our earlier article, however, was the possibility that the committee could remain deadlocked for other reasons. Such reasons could involve additional payments which Preston Gates may have some difficulty explaining. Should the ethics committee meet, some democrats could face similar problems for Tom DeLay. According to the the Washington Post, other names are beginning to surface, including both House and Senate members. Names discussed in the article include Thomas A. Daschle (S.D.) and Harry M. Reid (Nev.), Richard A. Gephardt (Mo. ), Sen. Conrad Burns (R-Mont. ), Patrick J. Kennedy (D-R.I.), Sen. Patty Murray (Wash.) and Byron L. Dorgan (N.D.). ...a California lawmaker recently urged a separate investigation into how the firm billed the Commonwealth of the Northern Mariana Islands after the auditor there reported the commonwealth "may have paid too much for services of Preston Gates. ... " Abramoff was the lead lobbyist. Since the April article, the Washington Post has stopped inquiring into Preston Gates activities with regard to improper finances. Back on April 24th, the Washington Post mentioned Preston Gates eight separate times while relating to Mr. DeLay's potential ethics violations. The Post never mentioned Greenberg Traurig in that article. In the June 3rd article, Greenberg Traurig gets six mentions and Preston Gates receives no mention at all. Previously, Abramoff charged expenses to a credit card billed to Preston Gates, and the Post stated that. Now, Abramoff's connections while at Greenberg Traurig have become the focus of the Post's attention. Yet, the questionable ethics violations supposedly happened while Abramoff worked for Preston Gates and it was their problem. Does it surprise you that Melinda French Gates holds a seat on the Board of the Washington Post Co.? You can see a listing of the Board here. You might also notice one bridge partner sitting on that board. Some people believe the seat of power in Washington, D.C. resides at the headquarters of the Washington Post. Certainly, membership on the Post's board would require a position of prominence in the world. Perhaps some people might wonder what Melinda Gates has accomplished to put her in such a seat of power. We can forget Melinda Gates position for a little while. We just want to establish the fact that she's there in a position of some power. We also want to mention the possibility that some relationship exists between Preston Gates and Microsoft's largest shareholders. ... what piqued my interest was the tidbit that the (Tom DeLay) flight invoice listed Preston Gates & Ellis, the firm that then employed Abramoff as a lobbyist. Computer history buffs will recall that Preston Gates & Ellis was co-founded by William H. Gates, Sr., the father of Microsoft founder Bill Gates. I point that out because only last week the New York Times reported that the Bill and Melinda Gates Foundation had contributed a substantial sums to the DeLay Foundation for Kids since 2001. For more information on the Gates contribution, see this hyperlink. Let's begin to make some sense of Microsoft's puzzling maze of influence. We'll only travel a short distance before seeing multiple paths on which we can travel. Regardless of the path we take, Microsoft has paved it with money. Preston Gates traces its roots to Harold Preston, who arrived in Seattle from Iowa in 1883 and started a solo law practice. Civic activist Jim Ellis joined in 1949. The firm of William H. Gates Sr., father of Microsoft co-founder Bill Gates, merged with Preston in 1990. In 1973, the firm opened its Washington, D.C., office, including on its nameplate former Democratic Congressman Lloyd Meeds, who represented northwest Washington from 1965 to 1979, and Emanuel Rouvelas, former counsel to the Senate Commerce Committee. As I mentioned Monday, getting William Gates Sr. together with Preston, Microsoft suddenly had an organization that looked like a law firm and not the legal department of Microsoft. The office in Washington, D.C. offered Microsoft and the Business Software Alliance a new way to reach out and affect government policy. 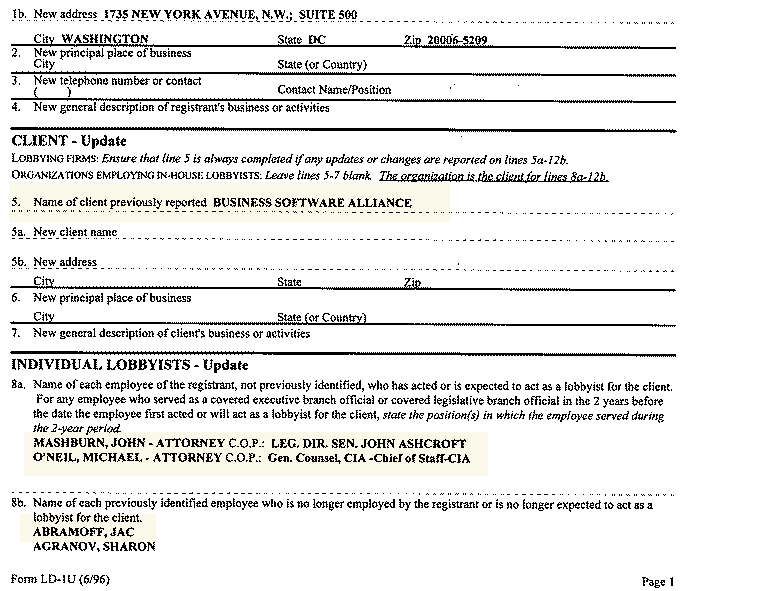 In Figure 1, you can see an excerpt from a lobbyist filing form showing Preston Gates & Ellis et al registered as lobbyists for the Business Software Alliance. Many such forms exist in the database at http://sopr.senate.gov. We can now ask some questions we would hope our legislators might ask. Who paid Preston Gates to lobby on behalf of the BSA? From where did the funds come? What did Preston Gates do? Doesn't the BSA have a staff of its own lobbyists? What do the BSA lobbyists do? 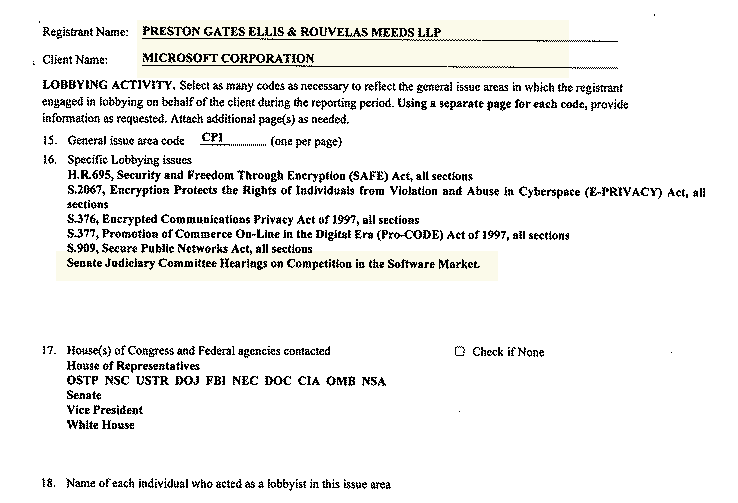 In Figure 2, you we can see another excerpt of a registration document showing that Preston Gates & Ellis also lobbies for Microsoft. In Figure 2 we can also see some of the issues that the lobbyists handled for Microsoft, who also has their own in-house lobbyists. In Figure 3, you can see the results of a query in the US Senate's lobbyist registration database. Preston Gates & Ellis has worked with the BSA for several years. Each link takes you to pages of information, names of lobbyists, expenses, issues on which the lobbyists work and updates when personnel rotate to other projects. 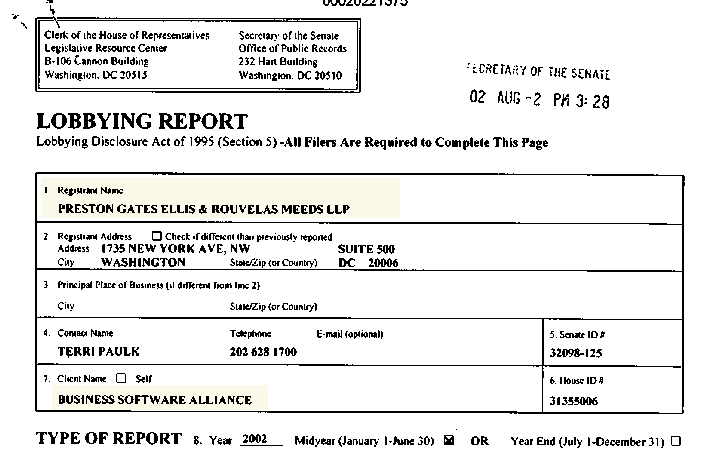 In Figure 4 you can see another excerpt of one of the registration forms found in the Senate lobbyist database. This excerpt appears to tell us that Jack Abramoff did work as a lobbyist for the BSA while at Preston Gates. While the Washington Post has started steering away from Preston Gates & Ellis, the information on this registration form should lead someone to look into or inquire about Abramoff's activities connected with the BSA. As one begins to examine the relationship among the BSA, Microsoft and Preston Gates & Ellis, perhaps a pattern emerges. One would want to take care before calling them interlocking companies or alter-egos. Still, consider the fact that the BSA enforces licensing for Microsoft. Some allegations exist that say the BSA waives penalties for non-compliant companies if those companies buy upgrades from Microsoft. We do not know if the BSA has that power. One would want to find out. Additionally, profiles of firm members at Preston Gates & Ellis provide information saying that many members of the firm work for the BSA. Does that mean the BSA outsources personnel from Preston Gates & Ellis? To answer that, someone would have to inquire and examine the evidence and arrive at a factual determination. Understanding the relationships among the firms seems important in light of many unexplained situations. The next two Figures will provide some insight into reasons one might believe that the three companies need examination. While circumstantial, the close relationships and inner workings could make one believe that not everything fits. 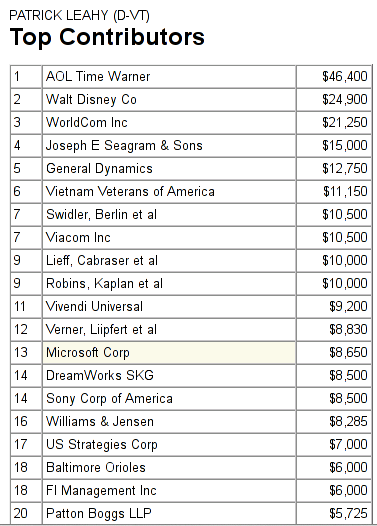 In Figure 5, one can see that the Chairman of the Senator Judiciary Committee received funds for re-election from Microsoft. This is the same Microsoft that the same the committee questioned with regard to the last Federal anti-trust settlement. In Figure 6, we excerpted two contributions and moved them into view of the camera. These contributions came from an earlier Senate race. 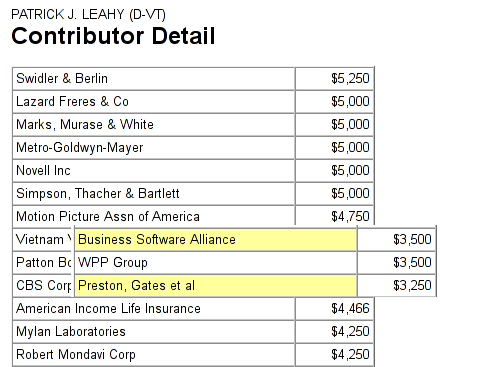 Notice that both the BSA and Preston Gates & Ellis contributed to the Leahy campaign. Difficulties exist in following Microsoft's money trail because of the many sources of data. Additionally, the registration forms of many candidates, lobbyists, assistant, staff, etc. do not exist in digital formats. One cannot mine the data easily. One might consider this an ideal scenario for a monopolist whose compliance audits related to its settlement with the Department of Justice exist in secrecy. Our courts have developed a test for determining the effectiveness of a remedy in a Sherman Act case: The remedy must end the anticompetitive practices, it must deprive the wrongdoer of the fruits of the wrongdoing, and it must ensure that the illegality does not recur. The Tunney Act also requires that any settlement of such a case serve the public interest. These are all high standards, but they are reasonable ones. In this case, the D.C. Circuit, sitting en banc and writing unanimously, found that Microsoft had engaged in serious exclusionary practices, to the detriment of their competitors and, thus, to all consumers. Today, we must satisfy ourselves that these matters have been addressed and redressed, or find out why not. It is astonishing that the agreement fails to provide any penalty for Microsoft's past misdeeds, creating both the sense that Microsoft is escaping punishment because of its extraordinary political and economic power, and undermining the value of antitrust penalties as a deterrent. Second, the agreement does not adequately address the concerns about Microsoft's failure to abide by the spirit or the letter of previous agreements, offering a weak oversight regime that suffers in several specific areas. Indeed, the proposed alternative dispute resolution for compliance with the agreement embraces many of the worst features of such systems, operating in secrecy, lacking independence, and open to undue influence from Microsoft. Member, House of Representatives (R-Texas). It's A Microsoft World. Five years after running afoul of the Feds, Microsoft is as powerful than ever. Pushing a platform instead of products could make it stronger still. Why nothing seems to stop it. Few people who have researched the company believe that Microsoft ran afoul of the Feds. How could a company that owns the Feds run afoul of them? Microsoft wields more power than the Federal government. Reading the following, you will notice just a single handful of people who have vested interests in making sure the Federal government stays out of Microsoft's business. Phil Bond: Undersecretary of Commerce for Technology. Bond is the highest-ranking appointed official who deals with technology. He is the former top aide to U.S. Rep. Jennifer Dunn (R-Wash.), whose district includes Microsoft's hometown of Redmond. Bond's top policy aide at Commerce was Connie Correll Partoyan, the former executive vice president of TechNet (a Microsoft-funded trade association), who recently took a lobbying job for the law firm Preston, Gates, Ellis & Rouvelas Meeds. William Kolasky: Appointed deputy assistant attorney general for international enforcement for the Justice Department's antitrust division in October 2001. Kolasky was a lawyer for the Association for Competitive Technology, a group whose largest contributor is Microsoft, and wrote a friend of the court brief supporting Microsoft in its antitrust lawsuit. Ed Gillespie : Until recently, he headed the Republican National Committee. Gillespie helped build the Republican party and identified candidates for state and federal elections. He has returned to Quinn Gillespie & Associates. Prior to becoming the head of the RNC he was a Microsoft lobbyist. Microsoft paid his lobbying firm, Quinn Gillespie & Associates, $1.2 million between 2001 and 2003, according to the Center for Public Integrity. Richard Wallis: Microsoft's associate general counsel chairs the American Bar Association's antitrust section. This group influences how much oversight federal judges have over antitrust settlements. In late June, a U.S. appeals court rejected claims that Microsoft's 2001 deal with the government was too lenient. Many difficulties associated with examining Microsoft's business practices exist. Many people have attempted to catalog and chronicle the various tactics used. The amount of material seems overwhelming. When one looks at such data, the human perception mechanism begins to shut down. To defend itself, people become confused and go into states of denial or apathy. While we can discuss much more evidence, I consider it a good approach to simply digest the material in smaller chunks. Hopefully we raised questions that people should examine. In the mean time, I will leave you with this quote I have seen frequently. "The liberty of a democracy is not safe if the people tolerate the growth of private power to a point where it becomes stronger than their democratic State itself. That in it's [sic] essence, is Fascism - ownership of government by an individual, by a group or by any controlling private power." Did Bill Gates Invent Linux and Has He Erased the Evidence? Linux News: Does Microsoft's Monopoly Power Extend to Government and Media?